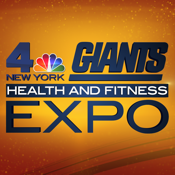 The NBC4 NY Expo to Go app is your complete guide to the NBC 4 New York and New York Giants Health and Fitness Expo. Use this app to walk the filed like a Giant! Interact with a full site map and get real-time listings of events: Zumba and yoga classes, cooking demos from a Top Chef, passing and kicking demos on the field, even meet your favorite New York Giants and NBC 4 New York anchors and reporters. This app will give you healthy tips and guide you to free health screenings and sponsored booths. This free, family-friendly event is from 11 a.m. to 6 p.m. on June 22 and 23, 2013 at MetLife Stadium!